An old man lies dying. Propped up in his living room and surrounded by his children and grandchildren, George Washington Crosby drifts in and out of consciousness, back to the wonder and pain of his impoverished childhood in Maine. As the clock repairer's time winds down, his memories intertwine with those of his father, an epileptic, itinerant peddler and his grandfather, a Methodist preacher beset by madness. 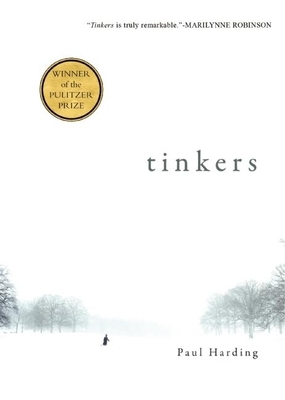 At once heartbreaking and life affirming, Tinkers is an elegiac meditation on love, loss, illness, faith, and the fierce beauty of nature. Paul Harding is the author of two novels about multiple generations of a New England family: the Pulitzer Prize-winning Tinkers and Enon. He has taught at the Iowa Writers' Workshop, Harvard University, and Grinnell College. He now lives in Massachusetts with his wife and two sons. Paul Harding is the author of two novels about multiple generations of a New England family: the Pulitzer Prize-winning Tinkers and Enon. A graduate of the University of Massachusetts, he was a drummer for the band Cold Water Flat before earning his MFA from the Iowa Writers' Workshop. Harding has also received a Guggenheim Fellowship and was a fiction fellow at the Fine Arts Work Center in Provincetown. He has taught at the Iowa Writers' Workshop, Harvard University, and Grinnell College. He now lives in Massachusetts with his wife and two sons.